Dr. John Lee wrote: Chemotherapy is an attempt to poison the body just short of death in the hope of killing the cancer before the entire body is killed. 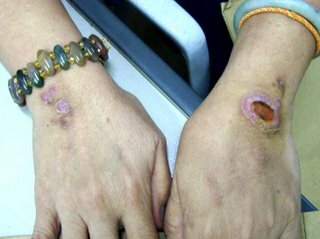 Der Spiegel, 4 Oktober 2004 had this article: Giftkur ohne Nutzen(The Useless Poisonous Cures): Increasingly sophisticated and expensive cellular poisons are being given to seriously ill patients … patients do not actually live a day longer. 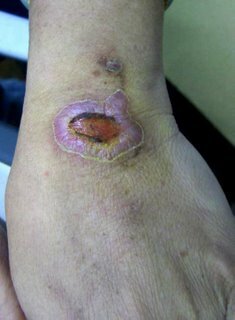 This is what it is like if a chemo-drug spills onto an unprotected hand. The photos below show what could happen if the chemo-drugs leak out at the point of injection. Most cancer patients in this country die of chemotherapy. Chemotherapy does not eliminate breast, colon or lung cancers. This fact has been documented for over a decade. Yet doctors still use chemotherapy for these tumours. Women with breast cancer are likely to die faster with chemotherapy than without it. They are only effective in 25% of pateints. What happen to the remaining 75%? Drugs in the market don’t work in everybody. More than 90% of drugs only work in 30 to 50% of the people. Drugs for cancer are only effective in 25% of the patients. Reference: Daily Express, 8 Dec. 2003. The Sun, 9 Dec. 2003. Quotations from Enter TheZone by Barry Sears, Ph.D. The existing treatments for cancer are probably the most barbaric in modern medicine, pg. 166. It is clear that cytotoxic chemotherapy only makes a minor contribution to cancer survival. The benefits of chemotherapy have been over-sold. The emperor’s new clothes — can chemotherapy survive? Reference: Clinical oncology 16 (8):549-560. 2004. It is, however, quite surprising how often the rule of “first do no harm” is ignored. Although there is a natural tendency to recommend treatment in every case, one needs to keep a clear head as to what, realistically, might be the consequences – both beneficial and harmful. We have moved on, I think, from the indiscriminate and largely valueless use of chemotherapy in situations where there could be no justification other than the physician’s desire to do something. Does it mean that in the past, chemotherapy had been used on patients indiscriminately and that it was valueless? How about today? Virtually all anti-cancer drugs are toxic and destroy the immune system. They are poisonous and kill both the cancerous and the normal cells. They attack the bone marrow destroying the white blood cells (which fight infection), the red blood cells (which carry oxygen), and the platelets (which help blood to clot). Patients undergoing chemotherapy may die of pneumonia or common infection. Death from toxicity is also common. In one study, 10% of 133 patients died as a result of direct toxicity to the chemo­drug 5FU. They can cause secondary cancers (such as gastrointestinal tract, ovaries and lungs) five, ten or 15 years after the successful chemotherapy. 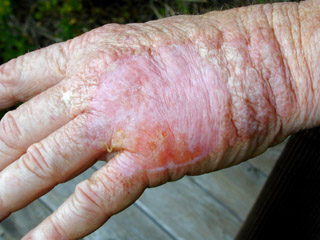 Long term effects of chemotherapy can include heart damage and increased risks of recurrence. … in terms of life expectancy, the chance of survival (after undergoing radiation, chemotherapy or surgery) is no better with than without treatment, and there is the possibility that treatment may make the survival time less.